Being a girl that uses public transport at least twice on a daily basis, having my spotify playlists ready to go is pretty much standard. And being a girl that also counts down to Christmas from the 26th of December, it's also standard that I have my music decked out with the best of the best Christmas jams. 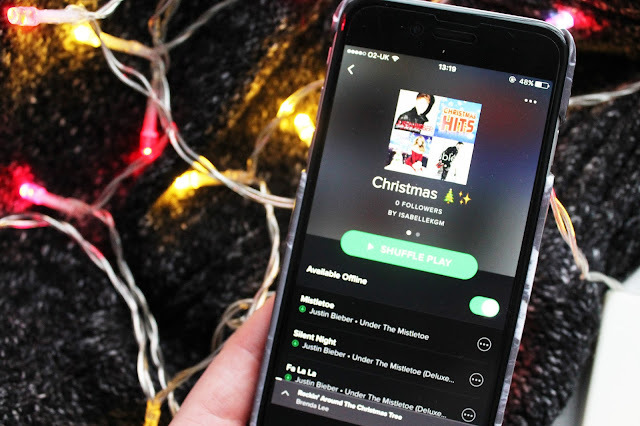 May I present to you my fabulous festive playlist, bound to blow your fluffy socks right off. Okay before you judge me, Justin Bieber is number one on the list..BUT, before you jet off in the opposite direction as fast as your legs will carry you (metaphorically), I'll have you know that there's something here for everyone. Buble, Elton John, The Pogues, Mariah Carey - even the cast of Glee (I feel y'all judging). Prepare yourself for some incredible Christmas classics that'll get you into the festive spirit! You can listen to the playlist below, and you can click here to follow it! What're your favourite christmas songs? Bieber Christmas album is the BEST! You always need a bit of Buble too! I am not fan of Justin however these songs are really good! Love this playlist, I'm happy to see Buble on there! Michael Buble is the only person I'll listen to at christmas haha! You have a good selection of festive songs to switch between. I never get bored of listening to 'Fairytale Of New York'! You can never go wrong with a bit of festive music to lighten the mood! Kelly Clarkson's underneath the tree is my guilty pleasure!